And so the 2014/15 campaign ended today as it did last season, in glorious failure in an away playoff tie which saw even the opposition fans applaud our team off the park. 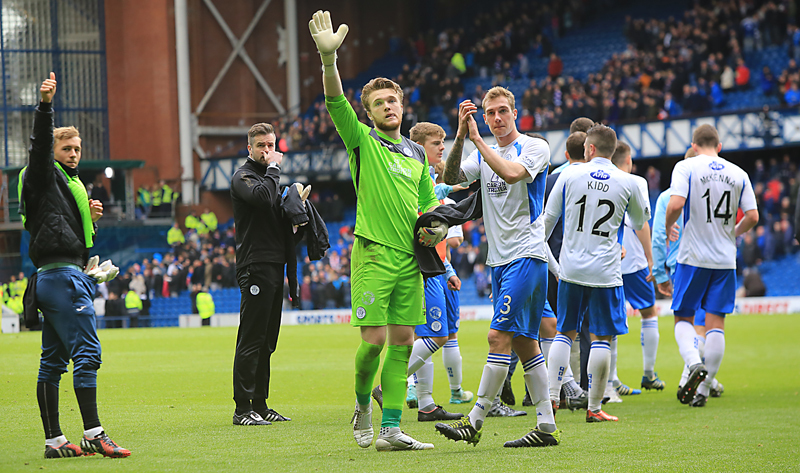 It wasn`t our best performance of the season, but it`s an indication of how good this team has been this season that it can have Rangers rocking back on their heels in front of a near sell out crowd at Ibrox when they aren`t even at their best. 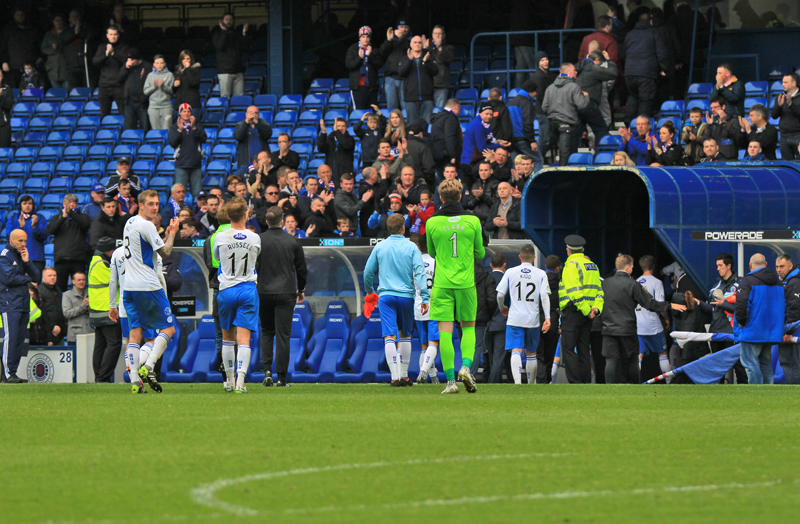 It`s probably the last we`ll see of a few of the players in a Queens shirt but for those who are leaving, they can hold their heads up and know that they gave absolutely everything for the team today. For that every one of us who saw the game and watched them this season salute them all. James Fowler and his players had stressed all week that we were not heading for Ibrox to make up numbers and meekly accept our departure from the playoffs. He made his intentions clear from the start with a positive change in starting the newly re-signed Mark Millar in central midfield ahead of the more defensively minded McKenna. Danny Carmichael also moved into a wider role than last weekend in a bid to get him more involved in creating things positively. 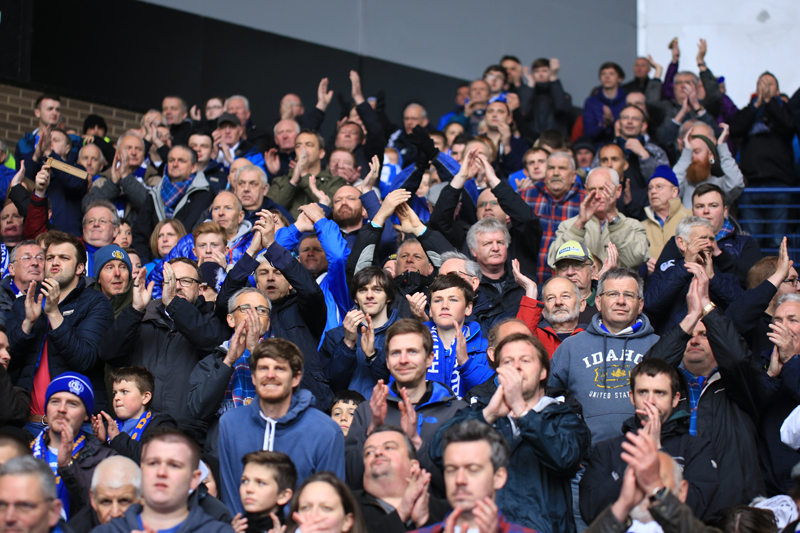 However, in the early stages it was the home side, with over 47,000 fans backing them, who dominated. Apart from an early half chance for Reilly, which was snatched well wide of target, it was one way traffic towards the Queens goal in the opening half hour as Rangers looked to kill the tie off early. It was therefore an ideal time for Zander Clark to produce undoubtedly his best performance in a Queens shirt as he repelled all that came near him. He was ably assisted by his back three who threw themselves into blocks like their very lives depended on it time after time. A goal looked destined to arrive soon and it duly did on 34 minutes.............. at the other end of the park! Completely against the run of play it was Queens who grabbed the lead. Possession was given away cheaply by Rangers and suddenly Danny Carmichael had an acre of space wide on the right and time to float in a perfect cross to the edge of the six yard box. Reilly might have gotten there but Derek Lyle did and the in form veteran grabbed his 21st goal of a magical season with a powerful header which Bell simply couldn`t keep out. 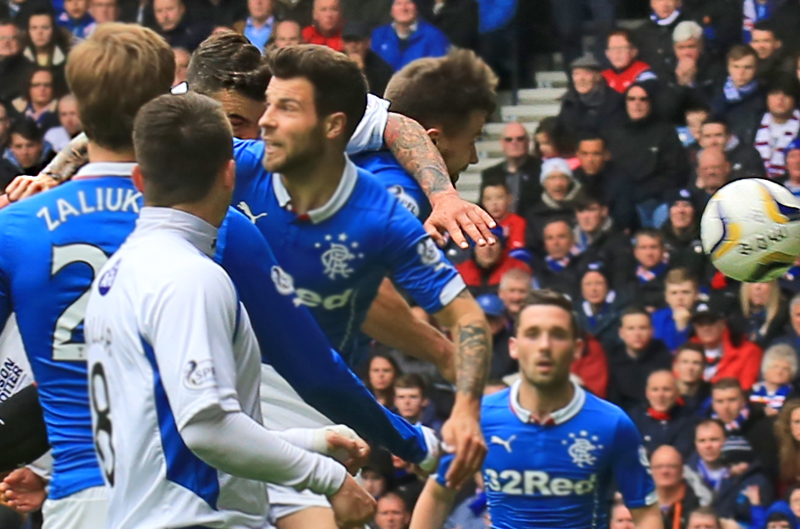 Rangers were stung by the goal but reacted positively. Clark had to plunge low to his right to tip a Vuckic free kick wide. Queens stood firm though and could even have added a second goal when Holt got on the end of a passing move and stung the palms of Bell from 25 yards out. Half time though saw the Rangers fans voice their displeasure at the way things were going. Queens came out for the second period buoyed by the lead and started much better. 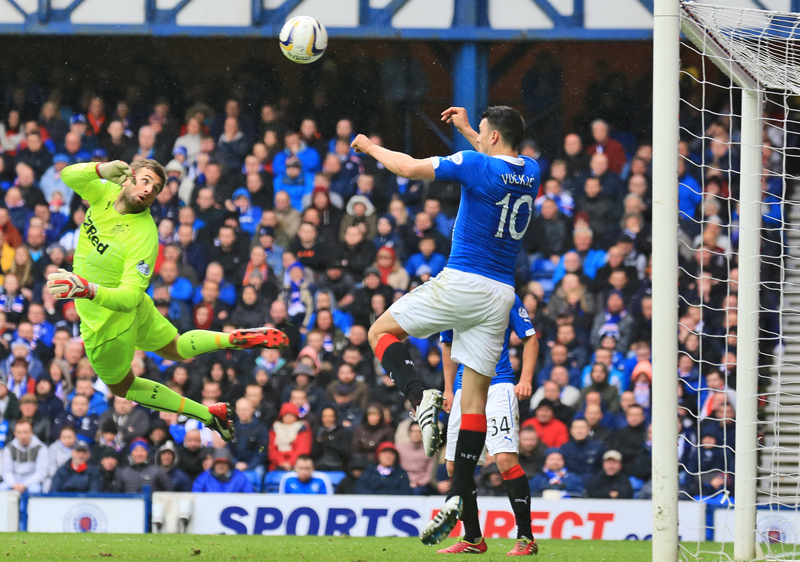 McShane had a shot saved before a magnificent diving save from Clark prevented Kenny Miller heading an equaliser. The pivotal moments of the match arrived just before the hour though. The Rangers defence parted like the Red Sea in front of Moses and suddenly Gavin Reilly was clean through on goal, bearing down on an unprotected Bell. It was a great chance to double the lead but instead the ball bobbled, he took a heavy touch and the chance was gone, the ball running out for a goal kick. 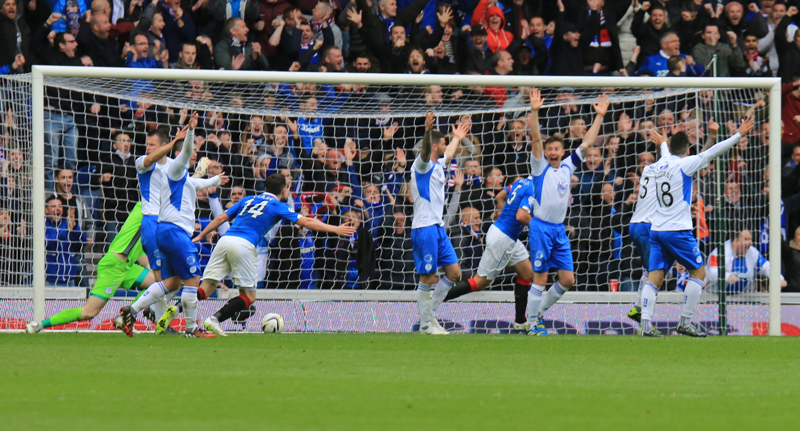 Within a minute Rangers were level. They broke up the left side and when Nicky Law floated a ball into the box Nicky Clark chested it down and Lee Wallace timed his run to perfection to meet it and plant the ball behind Clark. The Queens defenders complained bitterly that he was offside but tv replays later suggested the Scotland full back had been spot on with his timing. Queens had been preparing to take off Millar and replace him with McKenna and that duly took place within a minute of the goal. Soon after there was a tactical switch as Iain Russell came on for Durnan and we switched back to a 4-4-2 with Kidd dropping into the right back slot and Russell going wide left. In the 72nd minute Fowler played his final card, looking to see if young Aidan Smith could repeat his scoring exploits on his previous Ibrox visit aas he replaced Reilly. A combination of the changes and Rangers inevitably trying to protect what they had a bit led to Queens dominating the remainder of the game really. Lewis Kidd was high with a pot shot from 20 yards and then it was Lyle who came so near to grabbing his second. His curling shot was arcing towards the top corner with Bell nowhere near it following a McShane corner when Haris Vuckic stretched his neck muscles to head the ball off the line and out for another corner. McCall decided it was time to stop any pretence of an attacking threat and withdrew Clark and Shiels for two more defenders in Mohsni and Smith as Rangers incredibly decided to see out the game with a back six! Queens had the upper hand now but had massed ranks to find a way past. Russell went wriggling into the area but didn`t draw a foul and his cross was too deep. Holt`s header from another corner brushed past the post on its way wide. Kidd lifted a cross into the box but couldn`t find a Queens head. Mohsni broke clear but rather than run to the corner inexplicably made what amounted to a 25 yard pass back to Clark. Miller broke away a minute later and didn`t make the same mistake. The wily veteran headed for the corner flag and eventually Clark gathered his low cross. There were three minutes of added time and with 30 seconds to play Queens got one final chance with a free kick, 25 yards out in a central position after Mohsni upended Aidan Smith. Oh for a Stevie Smith moment or even another Kevin Holt one from back in January. This one fell to McShane though and he clipped the top of the wall with it. The chance was gone and so was all the extra time. Referee Kevin Clancy, who had an excellent game and kept things flowing well, blew his final whistle and Ibrox rose to applaud their team through to the next round where they will face Hibs on Wednesday. 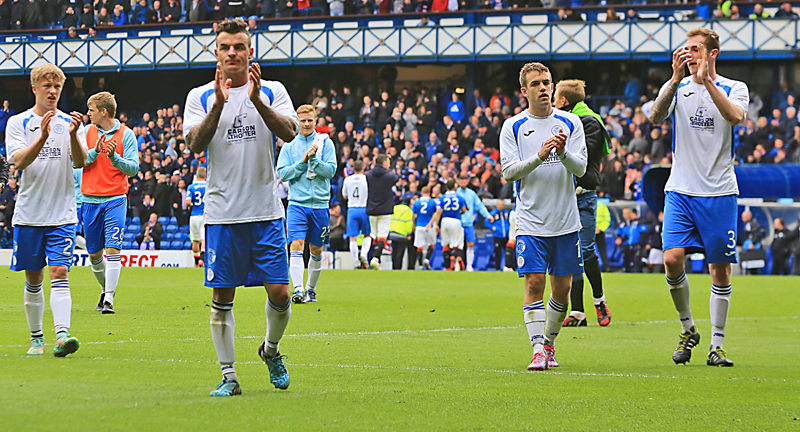 However, when the Rangers players had left the park they didn`t stop applauding. Instead those who remained in the ground also rose to clap off the Queens players as they trooped off having been over to our own fans in the far corner first. In the end then a fantastic campaign came up narrowly short but we have plenty to be proud of an plenty to look forward to next season.